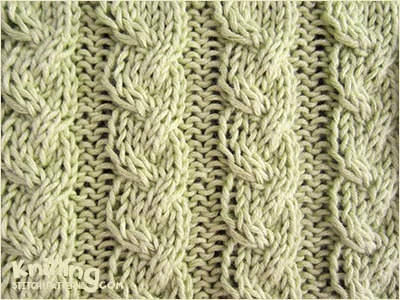 Knitted in a multiple of 9, + 3 sts and 6-row repeat. Row 1 (RS): * P3, k6; repeat from * to last 3 sts, p3. Row 2: * K3, p6; repeat from * to last 3 sts, k3. Row 3: * P3, C4B, k2; repeat from * to last 3 sts, p3. Row 4: * K3, p6; repeat from * to last 3 sts, k3. Row 5: * P3, k2,C4F; repeat from * to last 3 sts, p3. Row 6: * K3, p6; repeat from * to last 3 sts, k3. C4B: Slip 2 sts to cable needle and hold at back, k2, k2 sts from cable needle. C4F: Slip 2 stitches to cable needle and hold in front, k2, k2 from cable needle.